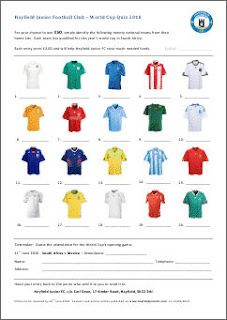 Our World Cup Quiz is a great way for us to raise funds and an even better way for you to win £50. Simply download the quiz and print it off. Complete it and return it to Carl at the address on the sheet no later than June 10th 2010. Each entry is only £2. If you're a junior you can win a prize if you've sold the winning sheet. The more you sell the more chances you'll have.